From intimate beaches to untamed rainforests, the NSW Coffs Coast combines a treasury of attractions without the crowds. After travelling the world, Christina Baker-You reveals why this stunning region is still her favourite pocket of paradise. In Down Under, Bill Bryson describes a hellishly dull evening passed in Macksville, about 500km northeast of Sydney. If only the American author had ventured a mere 10km further north, he’d have encountered a coastal river beauty spot from which he would have had difficulty dragging himself to complete the book. The Coffs Coast stretches for 50km between charming Red Rock in the north to the surfing Mecca of Scotts Head in the south, before creeping inland, uphill, as far as Dorrigo. By being almost precisely halfway between Brisbane and Sydney, for many of us (children of the ’60s, ’70s and ’80s, to be exact) Coffs has been nothing more than a night in a motel with a dirty pool near a rather bloated banana. Coffs Harbour captured from Muttonbird Island. Times have changed, though, and the region is backing up its marketing claim of being a legitimate holiday destination. Mild winters and warm summers laced with fresh ocean breezes are assisted by some smart crowd-drawing festivals and hinterland hideaways to complete its year-round pulling power. For those who do take the time to turn off the Pacific Hwy to explore it, the Coffs Coast provides rewarding respite from city stress with its irresistible scenery and leisurely pace. Thrill-seekers won’t be short of adventure either. Whitewater rafting, go-carting, horse riding, surf schools and skydiving are all within a short drive, but the true value of the area is in the well-earned relaxation afterwards. Cafés and picnic areas abound, and the wide beaches are the region’s pride and joy. Strikingly lovely, safe and clean, they remain strangely crowd-free. Sneaking down at the birth of the day, before the first early-rising dog walker has left trails of footprints in the sand, you’re blessed with the vision of the sun rising over the ocean; just one of the experiences that make this area so special. Despite the region’s wealth of offerings, it seems forever fated to be stamped into visitors’ memories as the home of the Big Banana. Passers-by seem unable to resist the hypnotic draw of the colossal yellow phallus. From the unlikely attraction’s humble beginnings in 1964 (the first of the Big Things to sprout nationwide) it’s grown into a consistent family favourite. Once you’ve satisfied your giant fruit urgings, you’ve got three basic visitor areas to explore: the jetty, the main street mall and the monster shopping mall further up the highway. You know you’ve reached the jetty area when you stumble across a bright blue pub followed by a stretch of newish and metro-styled cafés and restaurants. Across the railway tracks you’ll find the most iconic eatery in Coffs: the Fisherman’s Co-op, dishing out freshly caught seafood just crying out to be devoured on the break-wall. Passing an array of fine sailing vessels nodding in the harbour, you’ll find yourself in Muttonbird Island Nature Reserve. Thousands of the shy migratory birds (also called Wedge-tailed Shearwaters) breed here during summer. A winding path takes you through the nesting area and provides spectacular views of the harbour itself. When the birds fly off to the Philippines, the humpbacks move in; June to November is whale-watching season, with a number of companies running daily tours from the jetty. But if you’re after marine life without the need for sea legs, Coffs Harbour’s Pet Porpoise Pool has become a local institution. The marine rescue and rehab centre was opened in 1969 (when dolphins were still called porpoises) and has the best interaction with sea life for kids of all sizes anywhere in the country. You can shake flippers with dolphins, feed fairy penguins or receive a rather pungent fishy kiss from one of the resident sea lions. And while the place is cramped and straining to get the space it needs, it does do serious rehabilitation work (for more info). For flora buffs, Coffs Creek and the North Coast Regional Botanical Gardens sit just behind the Coffs Harbour High St shopping district. The gardens are 19ha of impeccably designed landscapes containing the perfect blend of native and exotic plants. Man-made ponds, fountains, lakes and vivid blooms compliment the natural beauty of the bushland, transforming the area into an Eden to tantalise the senses. Lying 45 fertile kilometres south of Coffs, Nambucca is known to locals affectionately as Hibiscus Land, thanks to the proliferation of the flower throughout the town. Over the past 30 years Nambucca has graduated from sleepy fishing village to trendy tourist centre and – perhaps above all – retirement magnet. The jewel in Nambucca’s crown is its river. Boats are available to explore its creeks and tributaries and it’s easy to detach yourself with naught but a fishing rod for company and not a soul around to mar the peace. Wedge-tailed eagles circle above. Pelicans and Jabirus stalk the grassy banks. Dolphins slice silvery curves through the water only metres away, causing sightseers to gasp and fishermen to curse as they bid farewell to the day’s catch. 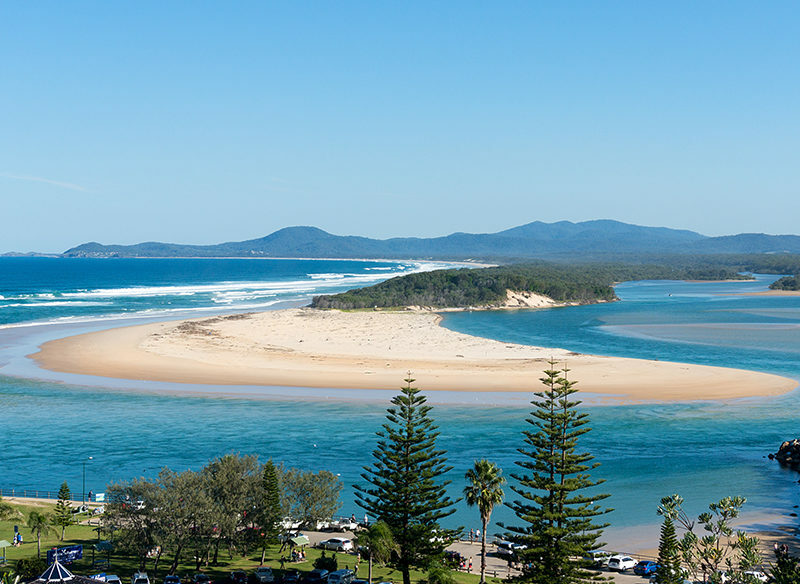 Rotary Lookout, with its spectacular views to the Nambucca River and Warrell Creek, is the favoured spot of many locals, a place to which they regularly flock to remind themselves just how lucky they are. 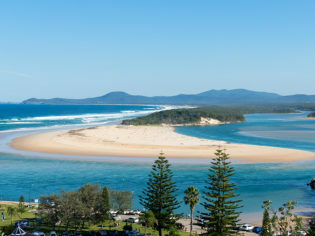 With its sapphire waters twisting and turning around golden sandbanks, “Nambucca” comes from the Gumbaynggir Aboriginal word for crooked river. Nearby Captain Cook Lookout is the highest point in town and perfect for absorbing the marriage of river and sea. You get a real sense of having arrived at the edge of the world. It’s unlikely you’ll leave Nambucca without venturing at least once along its famous V-wall. For decades, residents and holidaymakers have decorated the rocks with vivacious multicoloured artwork and messages. Boyfriends proclaim their undying love. Artists showcase their talents. Families write about what a nice holiday they’ve had. Everyone takes full advantage of this imaginative opportunity to say that they woz indeed ’ere. A stroll along the wall ends at the intimate beach by Wellington Rock. The craggy mass, named for an unfortunate ship run aground in 1892, rises like a giant’s head from the white froth – too dangerous for swimming but an idyllic spot for couples to sit and imagine themselves in that scene out of From Here to Eternity. Another of the town’s curiosities, the Island Golf Course, lounges smack in the middle of the river (the ultimate water trap), providing endless opportunities for enterprising youngsters to dive for lost balls, then boldly sell them back to the golfers who lost them in the first place. The causeway joining the island from the rest of Nambucca has been known to flood. You can imagine the mournful tones as golfers phone wives to say they’re stranded in the club with a load of mates, Fred the friendly barman, and several kegs of untapped beer. In recent years Nambucca’s town centre has become a haven of stylish cafés and souvenir art. A lively Gaudi-esque mosaic mural brimming with all manner of sea creatures winds its way down main street. Nearby a sub-tropical rainforest walk snakes down the cliffs to meet the river at Gordon Park. The stroll continues towards the estuary along a boardwalk, passing over quiet mangroves where Azure Kingfishers flit coyly in the branches of nearby shrubs, adding flashes of blue to the dappled greens. Aside from having the region’s usual seaside attractions, Woolgoolga is home to Australia’s largest Sikh population, and so resounds with the colour and vibrancy of Indian culture. The anachronistic Guru Nanak Temple perches like a mini Taj Mahal on a hill overlooking the Pacific Hwy, and if you’re not careful you’ll find yourself there for hours, gazing at the architectural grace of its flowing archways and sky-piercing, gold-tipped domes. As well as being a place of worship, the temple welcomes visitors, providing great insight into a fascinating culture. Seductive Bellingen on the Waterfall Way is hugged by greenery on all sides and retains an artistic ambience bordering on the spiritual. From all corners of the town, shaded cafés smile welcome. The magnificent Hammond and Wheatley building on main street is a picture of early 20th Century grandeur. Ignore the laughably inflated prices of its fashions and home wares; just enter for the sheer delight of parading up and down its impressive staircase. One of the most underrated treasures in NSW, Dorrigo is a steadfast rival to any of this country’s more famous national parks. Less than an hour’s drive inland, this easily accessible World Heritage-Listed site is interwoven with tracks through lush rainforest to tucked-away waterfalls. A symphony of bird calls swirls around you. Giant staghorn ferns fan out from trunks. The whole area fills you with a sense of privilege, as though you’re the first to set foot here. After experiencing the beating heart of the rainforest, steal an even rarer view from the Skywalk. This wooden boardwalk stretches far out above the canopy, offering terrifyingly beautiful views of the dramatic turquoise haze beneath. I spent the bulk of my childhood and adolescent years on the Coffs Coast. Like many small-town teens, I couldn’t wait to break free from Nambucca and head to the cities and beyond. Today, having visited sights internationally renowned for their beauty – the Greek Islands, The Italian Lakes, The French Riviera – the words of the well-known song ring true, I still do call Australia home. But my Australia isn’t the iconic visions that flood most foreigners’ minds: the vibrancy of the Reef, the scarlet mystique of Uluru or the ivory sails of the Opera House. My Australia is fishing with my Dad on the glorious, untamed Nambucca River – my own little pocket of paradise. Coffs International Buskers & Comedy Festival: Over 100 buskers from around the world participate each September in the streets of Coffs Harbour in this explosion of non-stop entertainment. Check out www.coffscoast.com.au for more information.